One-pot Homemade Spaghettios with Italian sausage and crushed San Marzano tomatoes: all the fun of the canned stuff and ten times more delicious. Hey, I have something pretty fun for you today, One-Pot Homemade Spaghettios! I know, I’m excited about it too. This is the ideal dinner idea for those world-weary days when you’d like to feel like a kid again and eat something delicious out of a can with a cartoon character on the side of it, without actually, you know, eating something out of a can with a cartoon character on the side of it. One-pot Homemade Spaghettios is all the saucy, pasta-y fun of the canned stuff, but classed up a little to better appeal to your grown up sensibilities. Best of all, it’s cooked all in one pan, so sure, it’s a little more work than opening up a can and heating it in a pot, but it’s still the same number of dishes to wash.
And when I say work, I don’t mean much. This is actually an incredibly simple dinner to make, and most of the cooking time is hands-off simmering time. 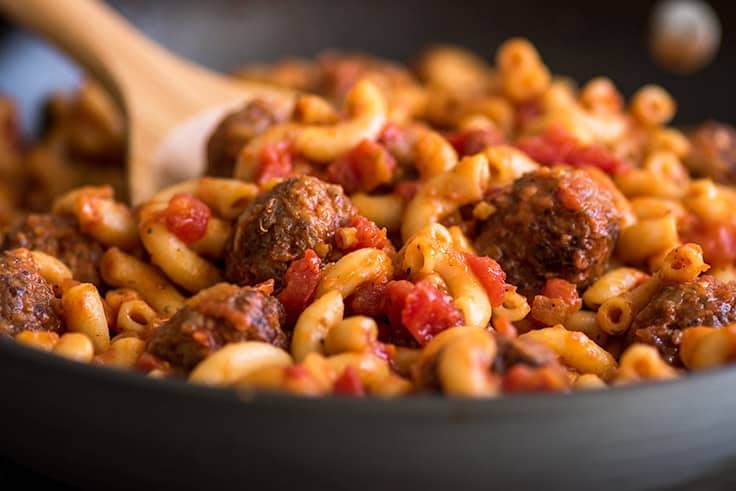 Our Homemade Spaghettios start with a couple links of mild Italian sausage (if you don’t usually cook with sausage, see the recipe notes below for some extra tips). You squeeze them out of their casings and shape into cute little meatballs that get browned in butter. After that, you cook some onions and garlic in the drippings, and once those have gotten a little stove time, you’ll add the pasta to the pan. The type of pasta you use is up to you. If you want super traditional Spaghettios, you’ll want to use anelli or anelletti, but depending on where you live, you might have trouble finding them locally (I did!). Other good options are conchiglie, orecchiette, or macaroni (what I used in the photos). Following the pasta are the rest of the ingredients, including a little dash of apple cider vinegar, which boosts the flavor and gives everything a fabulous tangy kick. 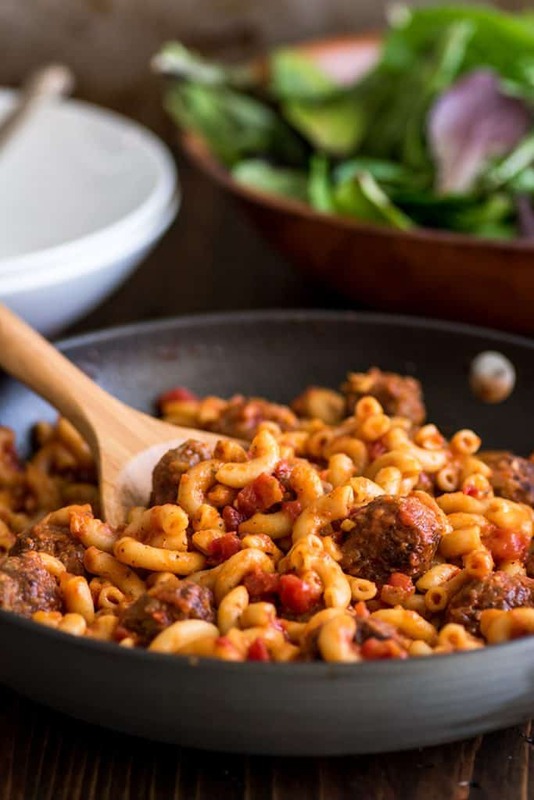 Simmer together for 25 to 30 minutes, just enough time to do dinner cleanup and chop veggies for a side, and then dig into your super saucy fabulous grown-up pasta with a childlike amount of glee and enthusiasm. If you don’t usually cook with/buy Italian sausage, you can generally find packages of it near the hamburger in the butcher department. To remove the casings, you can make a shallow slice down the sausage lengthwise and peel it off, or just squeeze the sausage until it bursts out the top or bottom and squeeze the meat into a bowl. Italian sausage is usually sold by the pound and this recipe calls for 1/2 pound of meat. You can freeze the extra sausages in their casings or form the extra meat into meatballs and freeze to make this dish again later. Just be sure to defrost the meatballs completely before cooking. Turkey sausage can be substituted, but if there’s not enough fat in the pan after browning your meatballs, you may need to add another tablespoon of butter to the pan before adding your onions. Perfect sides for this dish include: super simple Broccoli Steamed in the Microwave, crunchy Panko Parmesan Broccoli, and the ever-popular Butter and Garlic Green Beans. As written, this recipe makes two huge or three more modest servings. To change the recipe yield, hover over the number of servings (or click if you are on mobile), and slide the slider. No cooking changes are necessary. Looking for more Dinner Ideas for Two? Try this Asparagus Chicken Pasta, Salsa Chicken, Baked Ziti, and Slow Cooker Beef Fajitas for Two. One-Pot Homemade Spaghettios is all the saucy, pasta-y fun of the canned stuff, but classed up a little to better appeal to your grown-up sensibilities. 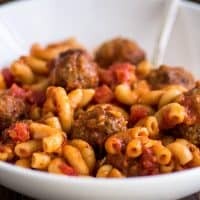 Best of all, it’s cooked all in one pan, so there are hardly any dishes to wash.
Scoop your sausage into approximately 16 half-ounce balls and roll into tablespoon-size meatballs. In a medium to large skillet, melt butter over medium-high heat. Add meatballs to the pan and cook a couple minutes per side until completely browned. Transfer meatballs to a plate. Turn heat down to medium. Add onions, salt, and pepper to the pan and cook until the edges of the onions turn translucent, 4 to 5 minutes. Add garlic and tomato paste/ketchup and cook for 30 seconds to 1 minute, until garlic is lightly golden. Pour in pasta, crushed tomatoes, 1 cup of chicken broth, apple cider vinegar, sugar, and oregano, and stir together. Return meatballs to the pan. Bring to a boil and turn stove down so your mixture is just at a simmer. Cook for 25 to 30 minutes, stirring occasionally, and adding a bit more of the chicken broth if too much of the liquid simmers away. 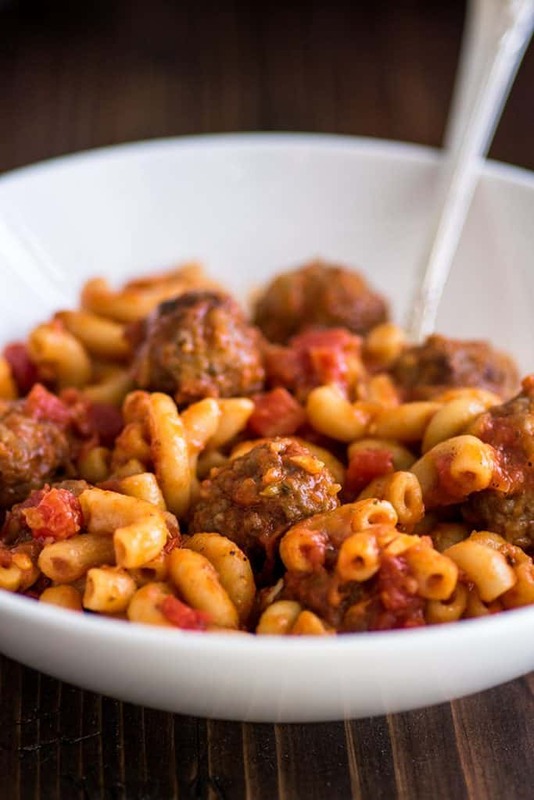 Dinner is done when the meatballs are cooked through and pasta is al dente. Serve with Parmesan cheese if desired, and enjoy! Approximate nutritional information is for three servings.